Changbing Yang attends the 3rd US-China Symposium on CO2 Emission Control Science & Technology. Click photo to view larger. Tip Meckel gives keynote address at RITE in Kyoto, Japan. November 13-20, 2010: Clean Air Task Force. 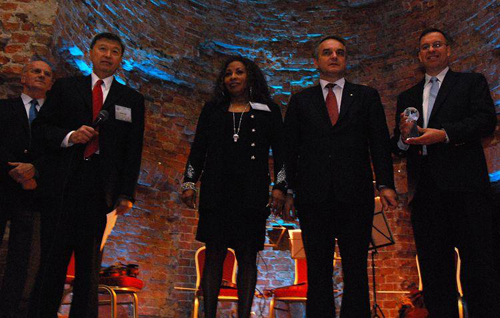 Ramón Treviño represents the Gulf Coast Carbon Center during a week-long fact finding mission to China with a delegation of 30 public, private and NGO leaders. The representatives will visit several carbon capture and sequestration sites and zero emissions power plants in China. To view the complete press release, please click here. Tianjian, Shanghai, Langfang, and Beijing, China. November 19, 2010: The American Oil & Gas Reporter updates February 2010 Cover Story on our sponsor and site host Denbury Resources Inc. and their emergence as a leader in CO2 EOR. For full story click here. GCCC's Ramón Treviño (far right) receives award from the Carbon Sequestration Leadership Forum recognizing the completion of the Frio test. September 14, 2010: Greater Houston Partnership Climate Change Committee. Susan Hovorka presents "Update on Gulf Coast Carbon Center Research on Geologic Sequestration" via teleconference. 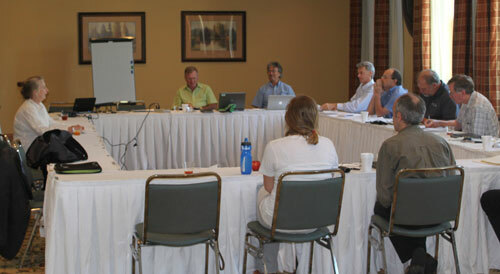 August 16-20, 2010: Thirteenth meeting of the Water Rock Interaction Working Group of the International Association of Geochemistry and Cosmochemistry. Katherine Romanak attended and presented "The Role of dedolomitization in the detection of anthropogenic CO2 in freshwater aquifers." Guanajuato, Mexico. 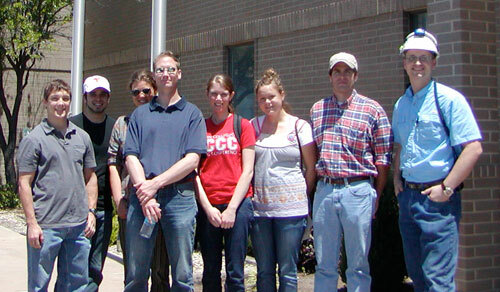 July 18-28, 2010: Research Experience in Carbon Sequestration (RECS) summer program. GCCC Research Intern Erin Miller attended a 10-day course consisting of scientific, technical, and policy lectures from top researches in the CCS field. Hands on experience in the field consisted of a fracture mapping exercise, surface monitoring observation, McElmo Dome plant tour, and a coal fired power plant tour at the PNM San Juan Generating Station. Albuquerque, New Mexico with field visits to Farmington, New Mexico, Durango, Colorado, and Mesa Verde, Colorado. 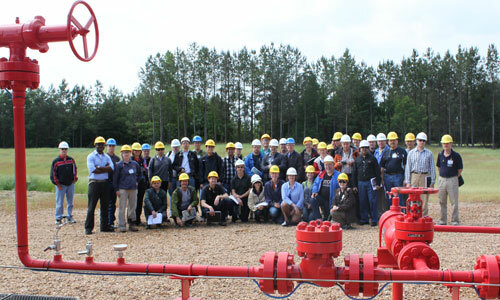 June 15-16, 2010: Department of Energy Geosciences Workshop on Carbon Sequestration and Geothermal Energy Systems. Susan Hovorka participates on the Subsurface Characterization and Development Panel. Washington, D.C.
June 28, 2010: GCCC will receive up to $19 million from the U.S. Department of Energy and NRG Energy to design and oversee a monitoring plan for a carbon capture and storage demonstration project in southeast Texas. 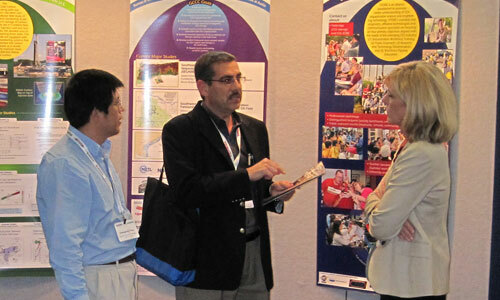 Changbing Yang (left) and Katherine Romanak (right) discuss CCS at the GCCC's information booth. Photo by David Freeman. May 6, 2010: STORE launches new website. 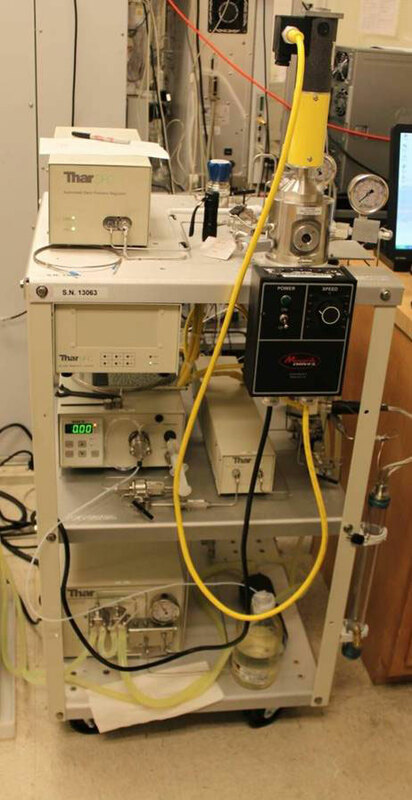 The overall mission of the Alliance for Sequestration Training, Outreach, Research and Education (STORE), which is partnered with GCCC, is to promote better understanding of CO2 sequestration science and engineering technology. See all of STORE's activities at www.storeco2now.com. STORE Co-PI and Project Director Hilary Olson (right) and Victoria Osborne of Striker Communications, Marketing/Communications specialist for STORE, demonstrate new STORE website at IEAGHG Monitoring Network field trip in Cranfield, MS.
May 6, 2010: Interagency Task Force on Carbon Capture and Storage Public Meeting. DOE Assistant Secretary for Fossil Energy Jim Markowsky and Deputy EPA Administrator Bob Perciasepe invite Ian Duncan to be part of the CO2 Storage Panel. President Obama established the Task Force and charged it with proposing a plan to overcome the barriers to the widespread, cost-effective deployment of CCS within 10 years, with a goal of bringing five to 10 commercial demonstration projects online by 2016. Washington, D.C.
GCCC's Susan Hovorka (left) during discussion with members of the Expert Panel. May 5, 2010: Expert Panel on Site-Specific Monitoring. Funded by the EPA and CCP, the first meeting of the Panel initiated discussions on determining the most appropriate monitoring approaches and strategies for carbon sequestration dependent on site-specific characteristics. 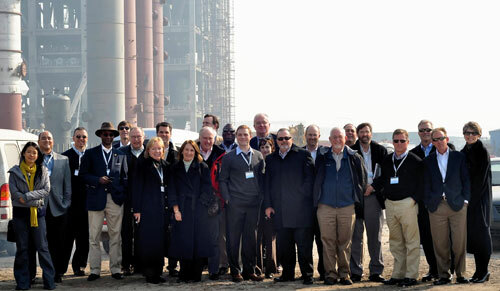 Nachez, MS.
Carey King (fourth from left) visits Sandow Power Plant. 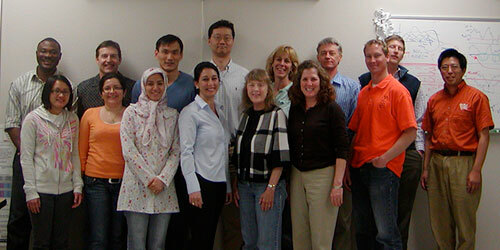 The Gulf Coast Carbon Center hosts Dr. Tiziana Vanorio of Stanford University (fourth from left, front row). 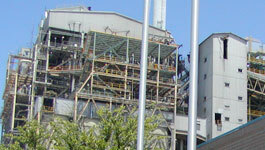 March 26, 2010: Gulf Coast Carbon Center. Dr. Tiziana Vanorio from Stanford University's spoke with members of GCCC about the rock physics program she leads in the Department of Geophysics and explored potential areas of collaboration. Austin, TX. 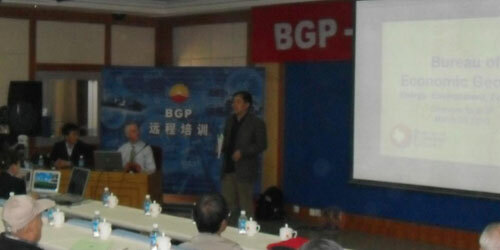 BEG's Eric Potter lectures on geologic sequestration at BGP in Zhouzhou City, China. March 25-31, 2010: Susan Hovorka visited China to talk about GCCC research part of a BEG delegation with Eric Potter and Honglui Zeng. She visited Dr. He Dengja and Xiao Jianxin at China Univerisity of Geosciences in Beijing, gave a lecture at BGP (China National Petroleum Company) in Zhuozhou City, Hebei province, and visited RIPED and Peking University. 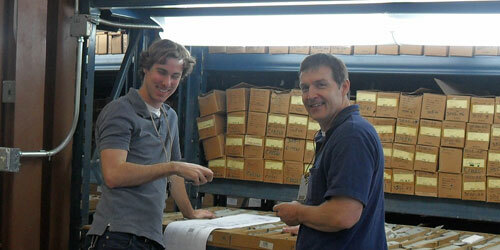 Kerstin Wallace and David Carr study cores in the BEG's Core Research Center. 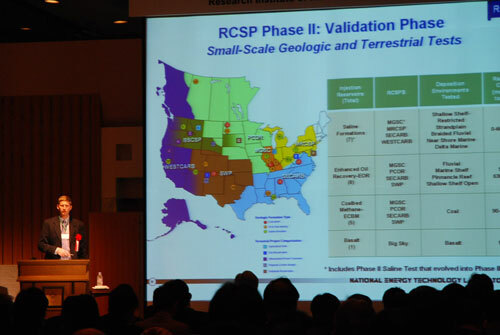 Scientists, engineers, and policy makers from Mexico, the United States and Canada met to discuss the development of the North American Carbon Atlas. GCCC's Ramón Treviño is third from the right in the center row. 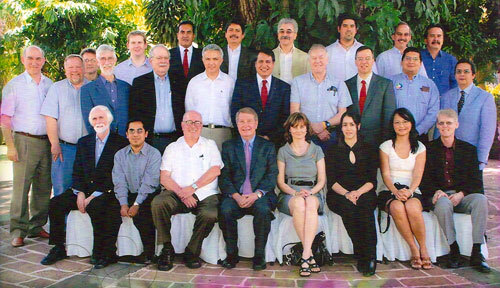 March 9-10, 2010: 3rd Meeting of North America Carbon Atlas Partnership. NACAP is a partnership among Canada, Mexico and the United States to identify the sources of CO2 and the sinks for storing it in North America in order to advance the potential for carbon capture and storage to mitigate climate change. Ramón Treviño was invited to the meeting by the Department of Energy to present GCCC's current DOE-sponsored efforts in the Gulf of Mexico. Trevino's trip was funded by the Southeast Carbon Partnership (SECARB Phase III) and STORE (Sequestration Training Outreach Research and Education), another DOE sponsored project. Click here for a PDF of Trevino's presentation [PDF]. Cuernavaca, Mexico. March 9, 2010: The Railroad Commission of Texas (RRC) proposed rules that pertain to geologic storage of anthropogenic carbon dioxide (CO2-A) in enhanced oil recovery (EOR) fields (productive reservoir or saline formation immediately overlying or underlying the productive reservoir) in Texas. The proposal should be published in the March 26, 2010 issue of the Texas Register; the deadline to submit comments is 5:00 p.m., Monday, April 26, 2010. Click here for a PDF version of the proposal [PDF]. Scott Tinker and Katherine Romanak discuss the GCCC's near-surface monitoring program. February 4, 2010: BEG director Scott Tinker visited the Cranfield test sites for a film he is making on energy. Tinker interviewed Denbury president Tracy Evans and GCCC researchers Susan Hovorka and Katherine Romanak about the process of monitoring enhanced oil recovery to show that geologic sequestration is occurring. February 2, 2010: Research Institute of Petroleum Exploration & Development (RIPED), PetroChina. Jiemin Lu presents a talk "Monitoring CO2 injection at Cranfield, MS, USA." The talk was given to a group of researchers working on CO2-EOR projects in Jilin Province, China. Beijing, China. 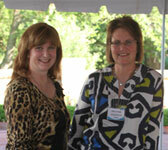 January 21, 2010: The Gulf Coast Carbon Center (GCCC) hosted the annual meeting of its Industrial Associates. Representatives from many of the Industrial Associates—Environmental Defense Fund, Exxon Mobile, Schlumberger Carbon, Conoco Phillips, Marathon, BP, Kinder Morgan, Chevron, Aramco, Entergy, and Luminant—were in attendance. Presentations were made by GCCC researchers Susan Hovorka, Ramón Treviño, David Carr, Katherine Romanak, JP Nicot, and BEG researcher Gurcan Gulen. GCCC students and research assistants presented their major achievements.The focus of the meeting was a five year retrospective of GCCC accomplishments and the development of plans for future GCCC activities over the coming five years. January 20-22, 2010: 10th National Conference on Science, Policy, and the Environment. Carey King presents "Texas and the clean energy transition: Can the most energy and CO2 intensive state lead the way?" Washington D.C.
January 18-22, 2010: Tip Meckel represents GCCC at a workshop that is a collaboration between Geoscience Australia and the Chinese Ministry of Science and Technology and their research partners, and is supported under the Asia Pacific Partnership on Clean Development and Climate. The workshop focuses on capacity building in the area of geological storage in China, plus facilitating storage-related research and prospectivity assessments. Canberra, Australia.